In the regeneration of coppice woodland there is usually quite a high proportion of wood that is unusable for either the traditional coppice products, or too small for using as timber for the saw mill, obviously much of this can be used for firewood, but much can be converted into charcoal for barbecues, forges and horticultural use. Modern ring kilns are used by most full time char colliers but these are too expensive for the small scale production of charcoal. Old 45 gallon oil drums make ideal, low cost, containers for charcoal burning and because of their small size they are easy to move around in steep woodland and do not need a large level area to site them. 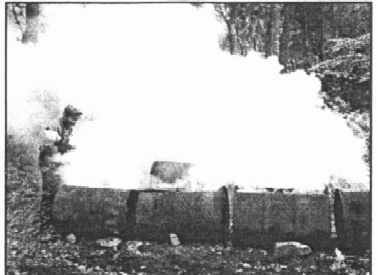 The drums are prepared by cutting a nine inch wide slot along the length, the section of barrel that is removed is handy to keep as a baffle for control of the burning process. Wood is prepared and cut to length of approximately 1/4 or 1/3 of the length of the barrel, it is better to prepare quite a sizeable stack if between four and six barrels are being used for the burn as it can become quite hectic for a while as the wood is being added to the drums. The drums are laid down with the slot in roughly the one o'clock position and initially a small fire is started in the middle of each drum, brown ends (the scorched, partially converted leftovers of the last burn) are usually used for this, when there is enough hot embers created they are raked out to both ends of the drum and more (small) wood added until the drums are well alight. 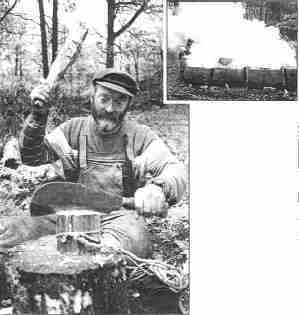 Wood is then laid into the barrels fairly tightly, welding gauntlets essential, and occasional shaking of the drums to settle the contents. Initially the smoke that issues from the drums will be white, this is a result of the water and volatiles being driven out, and occasionally a flare out will occur which looks very dramatic as these vapours ignite above the drum. As the conversion of the wood into charcoal progresses more wood is placed into the drums to keep them full, when the smoke changes from white to more of a blue haze this an indication that no more vapour is being driven off and that the charcoal is beginning to burn. Brown ends (incompletely converted wood), these are used for starting the next burn. Dust and ash, used as a dressing on gardens or on paths. The main photograph above shows me splitting willow in preparation for making artists charcoal, the inset shows me (just), tending the drums on the Autumn 2000 burn. Obviously I would normally not be standing in the smoke but the cameraman wanted that particular shot. I apologise for the quality of the images but they are scans of a black and white photocopy of a colour newspaper photograph. © South Lakes Citizen (Used without permission).